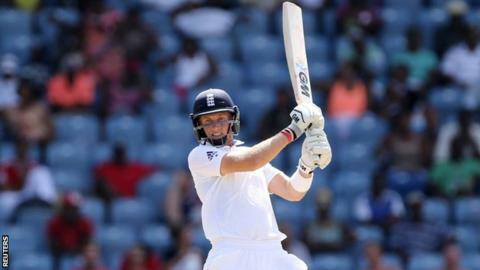 England are in a strong position after day three of the second Test against West Indies, thanks to a sublime century from Joe Root. With a 74-run advantage and four wickets left, they'll be hopeful of building a big first-innings lead and pushing on for their first away Test win since December 2012. It was a good, professional batting performance, with four players passing 50, but in some ways England could have made things easier for themselves. They twice failed to nail down strong positions: first when Alastair Cook and Jonathan Trott were going so well, and secondly after the 165-run stand between Root and Gary Ballance, when they lost a cluster of wickets. But overall they still have a strong chance of victory. They probably won't get the huge lead they were hoping for, but that may actually work in their favour if it encourages the West Indies to make a game of it rather than just playing for survival. "The best batting came from Root, he created momentum when he came in with good batting. He was not looking to smash fours, he was busy for ones and twos and put the fielders under pressure. He played wonderfully and he has found his niche at five. He really did not put a foot wrong." Cook will be hugely frustrated to have missed out on his 26th Test century. He knows as well as anyone that he simply has to get this monkey off his back. But his objective was to build a good platform with Trott, and he achieved that. He played well, and with four 50s in his last seven Test innings, he can justifiably point to a significant upturn in form since the low points of the Ashes and the Sri Lanka series. Inevitably, people will grumble on social media about the slow pitch and the attack not being top drawer, but you can only play what's in front of you. The only reason people are still going on about his century drought is that it's such an easy statistic to bandy about. If Cook was dogged, Root was dynamic in his unbeaten innings of 118. He's a very jaunty young man at the best of times, and from the moment he came in he was busy - which was exactly what England needed at a point in their innings when they were in danger of getting bogged down. He's playing as well as I've seen at the moment and clearly he's benefiting from batting in partnership with his Yorkshire colleague Gary Ballance, which he obviously enjoys. They're great foils for each other in the middle order, and while Ballance is a slightly more defensive player by nature, he very rarely misses out when you bowl him a bad ball. One incident that caught the eye towards the end of the day was Marlon Samuels' send-off to Ben Stokes when he was dismissed. I've always been very outspoken about sledging and bad behaviour in cricket. But I believe there is a place for humour on the cricket field, and in my eyes, Samuels' solemn salute brought a bit of levity to proceedings. Because umpires and some journalists haven't been speaking out against unsporting behaviour, the International Cricket Council has decided to clamp down and make an example of people, as they did with Wahab Riaz and Shane Watson at the World Cup. That really isn't necessary - all it takes is a bit of proper policing. I think it would be a shame if Samuels was punished for a bit of harmless fun.